1. Preheat the oven to 160 ° C / 140 ° C fan / gas. For crumbs, mix the bread in a food processor (or break by hand) and then fry the crumbs on a large baking tray. 2. Bake until golden brown for 15 minutes, then cool and set aside. 3. Cover a baking tray with non-stick baking paper and spread the cooled crumbs in one layer. 4. Put the 100 g sugar in a heavy pan with salt and 2 tablespoons of water and heat over medium heat. 5. Dissolve the sugar without stirring and turn the pan slightly so that it melts evenly. 6. Place the heat on an average level and let the sugar take on a dark caramel color that will spin around once in a while (about 10 minutes). It must be dark, but do not let the sugar smoke or turn black as soon as you think it has the right color, remove the heat and pour evenly over the bread crumbs. 7. When it is cold, stamp a thick crumb with a rolling pin (or a pulse in a food processor). 1. Put the egg yolk in a bowl with 1 tablespoon sugar and beat with an electric hand mixer smooth and loose. 2. Add the rest of the sugar to 200 ml of cold water and the vanilla pod in a small, heavy pan over a high heat until the sugar has dissolved. 3. Remove the vanilla pod (reserve) and cook the syrup until it reaches 120 ° C on the sugar thermometer; This takes 15 to 20 minutes. It will be thick and thick, and when a metal spoon is submerged and lifted, the last drops will form thin wires. 4. Pour the hot syrup gently over the egg yolk in a stream and store it continuously. 5. Scrape the seeds from the reserved vanilla pod and keep churning until you get a thick, creamy foam. In another clean bowl, whisk the cream with soft toppings and fold them gently into the mousse with a metal spoon with the crumbs. 6. Place in a plastic container or in a sheet form with an adhesive foil and freeze to solidify. 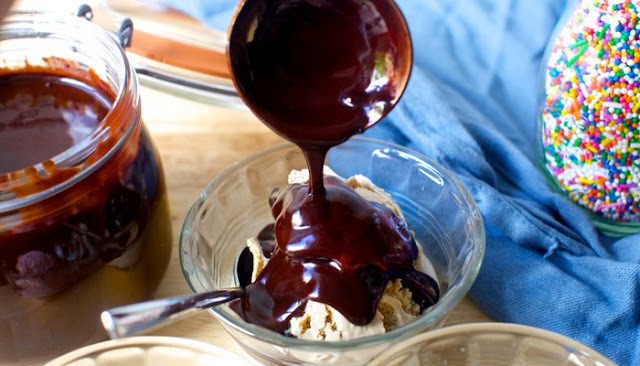 For the chocolate sauce, place all the ingredients in a small and warm pan and stir gently with a wooden spoon until the chocolate has melted and the sauce is shiny. 7. Cover the ice cream with the chocolate sauce. Oh my god... that looks great. Regardless of the season, I am a sucker for ice-sundays! I did that just a second ago and I wait until tonight, you feel so far away. My God, that makes me hungry! So I needed that recipe! I cannot wait! I have always made a syrup with coconut oil, but it always hardens! Good idea with cocoa butter! So good and easy! Wow, that looks good. I cannot wait to try it. I could hide it from the rest of my family, hahaha! Fresh recipe. If I cannot find it, what can I place? Hello Emma, you can find cocoa butter in our list of stock items. I did it the other night and enjoyed it with a vanilla vegan ice cream. We will definitely do it again! Thanks for sharing, Sarah. I bet it would work very well with a small banana cream, a perfect after-treatment. I always know that I drank enough coffee when I screamed enough to scare a cat, LOL! Your pups sound good.